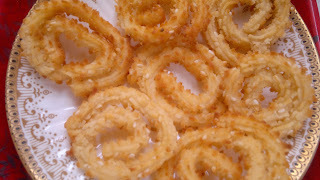 Chakli/Murukku recipe in Philips Airfryer - Chakli is a very interesting snack famous in India. It is also known as chakri in Gujarat and murukku in Andhra Pradesh. It is a very interesting snack which is spiral in shape with a spiked surface. This snack is very very healthy as it is made up of rice flour unlike other snacks which are made of refined flour. Make soft dough using all the above ingredients. Make rolls of the dough and put it in snacks instrument to make the chakli. Preheat the air fryer and fry the chakli in air fryer at 180 degree for 5-7 mins. Let it cool and store in cool, dry place. It's very very fantastic recipe.Philips Air Fryer what you have shared with us it's also nice. Thank you for your post.I will wait your next post.